The condition of Awang Raweng’s house, where there are electricity poles and wire but no power runs through it, and a water tank which is dry during drought. 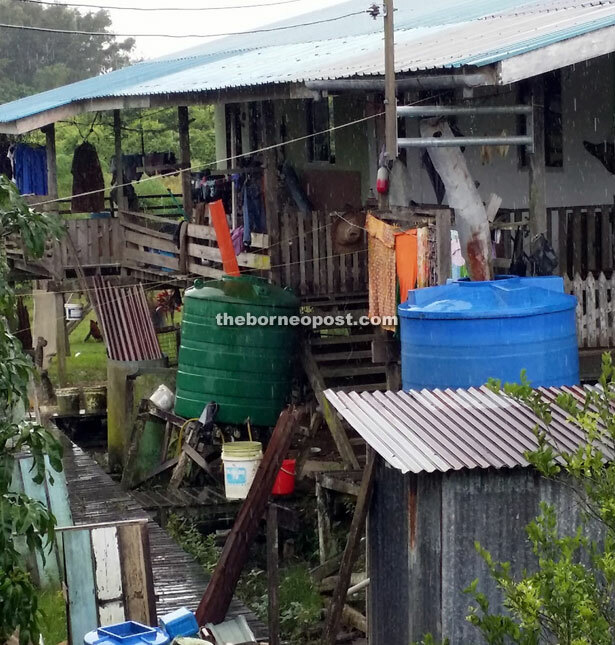 KUCHING: The absence of clean water supply to their homes has forced residents of Nanga Skrang in Sri Aman division to dice with danger everytime they bathe in the Batang Lupar river. This is because the river is also notoriously the habitat of crocodiles, and just last month, a toddler was lucky to escape alive following a lunge by the voracious man-eaters. A villager Kenyalang Awang said the people living in the area have no choice but to risk taking baths in the river during dry weather. “We depend on rain water collected in the 1Malaysia tanks given to us. But if there is no rain for continuous days, then we are forced to bathe in the river despite the high risk,” he said. As such, he urged the relevant authorities to speed up the water supply connection to the longhouses there to avoid any untoward incident. “Don’t wait until a tragedy to trigger action from you,” he said. And come nightfall, another affliction of the longhouses is the absence of electricity supply, where villagers are forced to depend on generators to power their electrical appliances on a periodic basis. The country’s sole George Cross recipient Awang Raweng, who is a longhouse chief, expressed his frustration with the lackadaisical attitude of the relevant bodies to connect the longhouses under the rural electrification scheme (RES). He said the poles and electric cables were installed four years ago, but until today the more than 100 residents in the longhouse have yet to enjoy round-the-clock electricity. Because of this, the 14 families under his charge could only use electricity supplied by a generator which only runs for a few hours from evening into the night. “What is the use of the poles and cables if there is no electricity supplied to us. Is this just to appease our eyes?” mocked Awang, adding that he personally paid RM1,000 for the connection of cables and wire to his house.